Better Lost Than Stupid recently announced their debut single, ‘Alto’, for new label, Skint/BMG. Released on 27 October, the track is the first new material from their as yet untitled debut album, which is set for release in 2018. Last weekend, they headlined the Ibiza venue, Amnesia (for the club’s closing party), the latest in a series of 2017 live gigs that have included a headline show at Koko in London, Razzmatazz in Barcelona, Circoloco at DC10, Krystal Club in Romania, and BPM Festival. 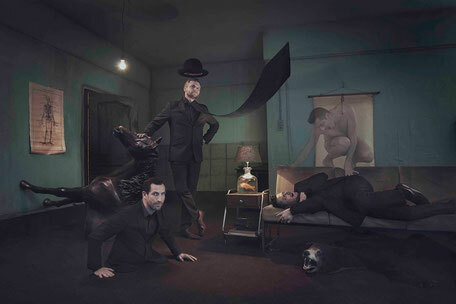 Better Lost Than Stupid, a trio comprising three producers - Martin Buttrich, Davide Squillace and Matthias Tanzmann - initially eschewed studio time to get out and play shows over the past 12 months, winning fans on a European club tour, hosting all-night sessions at DC10, and playing to festival crowds across the world. ‘Alto’ (which features a well-known, but for now unnamed, collaborator on vocals) is the first fruit from album recording sessions earlier this year. The track follows the free single, ‘Dynamite’ which dropped in February (and is included on this EP release); apparently a big record for Radio 1’s specialists and some big name DJs, the 7-minute instrumental was designed as a trippy, off-kilter intro to Better Lost Than Stupid, as ‘Alto’ shows, these are the first glimpses of a their vision. With the serious work of their debut album almost done, the trio will soon announce 2018 gig and festival dates, before unveiling further singles and the album itself. The band celebrated the forthcoming release of ‘Alto’ with a special invite only ADE show at A'DAM&Co in Amsterdam on 20th October.